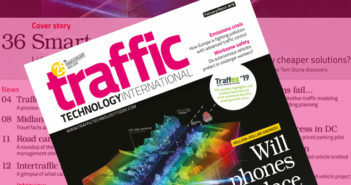 At the Traffex 2019 show that is taking place at the NEC Birmingham this week (April 2-4), the UK traffic equipment division of the German Jenoptik technology group has announced that its latest speed enforcement camera has achieved UK Home Office Type Approval (HOTA). Jenoptik Traffic Solutions is best known in the UK for its highly successful SPECS average-speed enforcement cameras, which are now used at more than 150 sites across the country. 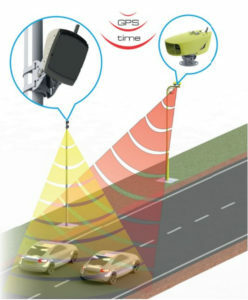 In response to customer demand, the VECTOR SR camera system was developed as a complementary enforcement device for the measurement of ‘spot speeds’. In situations where vehicle speeds need to be managed over a short section of road, VECTOR SR provides a practical and cost-effective solution, allowing those responsible for road safety to address collision hot spots, while also providing a practical alternative for obsolete ‘wet film’ camera sites. The new VECTOR SR unit uses the highly capable VECTOR2 integrated ALPR (Automatic License Plate Recognition) camera platform, working alongside Jenoptik’s own 3D tracking radar device. Both of these modules are lightweight and low power, allowing VECTOR SR to be mounted on a passively safe pole – something that has not been possible before with older enforcement technologies. For deployment in areas that have no streetlighting, the system can also operate alongside the patented VECTOR IR Infra-Red illumination module, allowing for image capture on a fully dark road without any distracting flashes or dazzling puddles of light. 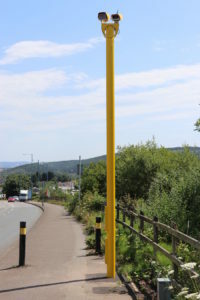 Supported by wirelessly synchronized infrared illumination, lightweight enough to mount on a passively safe pole or existing street furniture, and with no need for in-road sensors, Jenoptik says the VECTOR SR unit represents a step forward in speed enforcement technology. At the Traffex show, Jenoptik Traffic Solutions UK made the announcement that following extensive research and development, the VECTOR SR camera unit has achieved HOTA, passing the rigorous evaluation and testing required to allow it to be operated as an unattended enforcement device for the measurement of vehicle speeds.